This stunning sequel to Archetype will have you on the edge of your seat. Emma is on the run and Declan is pulling out all the stops to find her. When her cover is blown, she goes back to the Resistance and finds Noah with another woman. It is now up to Emma to figure out her future, be a mother to Adrienne, and sort out her feelings for Noah. M.D. Waters’ Prototype delivers the perfect ending to Emma’s saga. 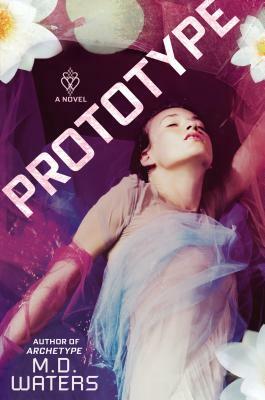 The stunning debut that began with Archetype and has readers buzzing concludes in Prototype, when a woman's dual pasts lock onto a collision course, threatening her present and future. Emma looks forward to the day when she can let go of her past both of them. After more than a year on the run, with clues to her parents whereabouts within her grasp, she may finally find a place to settle down. Start a new life. Maybe even create new memories with a new family. But the past rises to haunt her and to make sure there's nowhere on the planet she can hide. Declan Burke wants his wife back, and with a little manipulation and a lot of reward money, he's got the entire world on his side. Except for the one man she dreads confronting the most: Noah Tucker. Emma returns to face what she's done but finds that the past isn t the problem. It's the present and the future it represents. Noah has moved on and another woman is raising their daughter. In the shocking conclusion to M.D. Waters's spectacular debut, Emma battles for her life and her freedom, tearing down walls and ripping off masks to reveal the truth. She's decided to play their game and prove she isn t the woman they thought she was. Even if it means she winds up dead. Or worse, reborn. M.D. WATERS is the author of Archetype. She lives in Maryland.